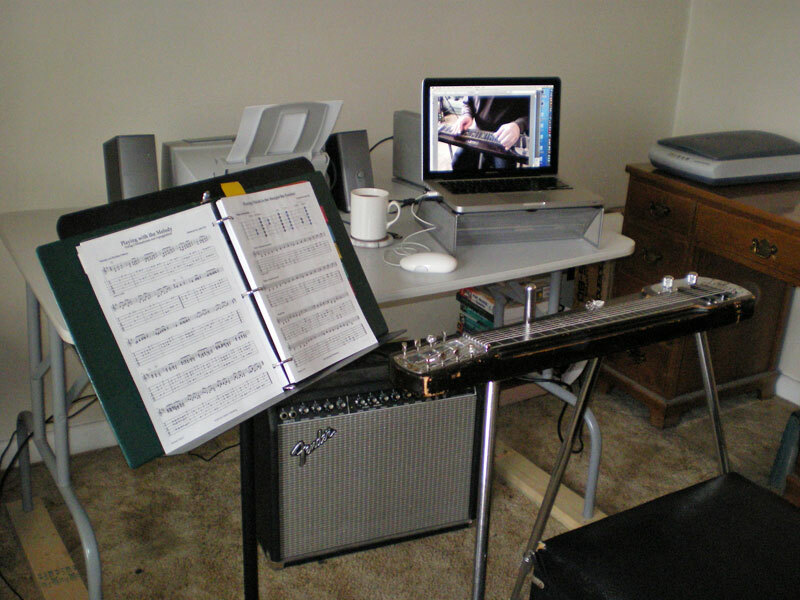 Thanks to an evolving Internet, I can now offer private steel lessons anywhere in the world to folks with the basic Skype video chat setup on their personal computer! I gave my first lesson on September 16, 2009 and it was awesome with relatively few glitches. A simple Skype setup that works suprisingly well: a MacBook Pro with built in webcam, two entry-level Bose speakers, and an inexpensive Fender solid state amp. No microphones needed! A fairly fast computer -- for best results, Skype recommends at least a Core 2 Duo 1.8 GHz processor. I have a 2 GHz machine that is over two years old and it works great. The Skype program -- go to Skype.com to access the download page. It's free! A webcam -- I have a built-in webcam on my Macbook Pro 13" that works well. I've heard that the Logitech webcams for around $100 are more than adequate. It helps to have an adjustable stand. That way you can really focus in on the hands and picks during the first few lessons to make sure your basic playing mechanics are sound. A decent broadband connection -- this is usually the weak link in a typical Skype setup. Skype now recommends 512 kbps upload speed for clear video. Skype offers free video calling and the package is well-designed and easy to use. If you're considering taking lessons, you can schedule a free test session to make sure the connection works as advertised before committing to lessons. Just email me or get in touch using my Guestbook and we can set something up. I'm currently charging a rate of $50 for an hour private lesson or $30 for a half-hour lesson payable via PayPal or by check if you're not comfortable with PayPal. You can schedule weekly lessons or just schedule an occasional a la carte lesson for a professional "tune-up." I'm able to give my weekly students extra attention including back-and-forth during the week, correcting of assignments, etc. There is no charge for the video call through Skype. Technique—A short 5-10 minute stretch to monitor problems with picking and bar motions that have creeped in since the last lesson. Another few minutes are given to some written out technical exercise, such as scales, harmonized scales, harmonics, arpeggios that usually cycle through a number of keys. Playing Project—The current tune or exercise that is the prime focus of practice during the prior week or other time period. Music is written out in both standard notation and tablature. I will gear the overall structure of lessons to your short-term and long-term musical goals. You may be primarily interested in country music, western swing and jazz, Hawaiian music, blues, or all of the above.